"It is really difficult to convince a taxi driver to carry your pet!" We have heard this often enough. 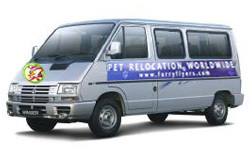 Furry Flyers offers A/C Pet-Friendly Taxi service ex-Mumbai to anywhere in India. In our taxi’s you can accompany your pet, whether you are travelling home from the airport or whether you need to take your pet to Goa or Nagpur. In our taxi's, your pet can sit with you on your lap! Our pet-friendly taxi fleet include: Innova, Scorpio, Tavera, Tata Winger and Indica. Pet Friendly car rental bookings should be preferably made minimum 7 days in advance prior to travel. If you need Pet Friendly car with carrier please inform us well in advance. Pet Friendly car rental Interstate taxes, permit fees would be extra. You are responsible for your pet & its behavior in the car at all times. The guest is requested to carry a bedsheet to cover the car seat, so that it doesn’t spoil the car seat. Any damage to the car seat is chargeable. Driver Allowance are applicable if the Pet Friendly car travels beyond city. Minimum billing of 250 km per day applicable for outstation destination. In the event of any accident or damage to the vehicle, or theft, the Hirer should inform our office and is required to obtain a First Information Report from the nearest police station at their own cost. Any parking, traffic or driving violation (in case not related to car driver mistakes) will be collected from the customer. INR rates are applicable to all . Pet Friendly car rental will be charged from the car rental office as the start and end point. Pet Friendly car rental tariffs are subject to change without prior notice. We request all the guest to take full responsibility of his/her items. In case of lost items inside the Pet Friendly car during the journey, we will try to locate the items on a "best-effort" basis but is not responsible for the same in case of loss or damage to the same. If the Customer leaves any goods in the Pet Friendly car or has any complaint in respect of the services or the use of the car, the Customer has to inform us of the same in writing within 24hours of using the services of cars. Rs.500/- will be charged as Non Refundable Deposit for Pet Friendly car rental.